Last week's G20 summit in Buenos Aires naturally captured world attention, with its focus on the global trade structure, and especially on the welcome ceasefire in the Sino-U.S. trade war announced by the leaders of the world's largest two economies following their bilateral meeting. However, it is important not to forget the importance of China's regional diplomacy, meaning the Belt and Road Initiative (BRI) that is underpinning its global strategy. Just before the G20 summit, and just after the APEC meeting in Port Moresby, Chinese President Xi Jinping visited the Philippines to strengthen the bilateral relationship, now raised to the dignity of a strategic partnership. 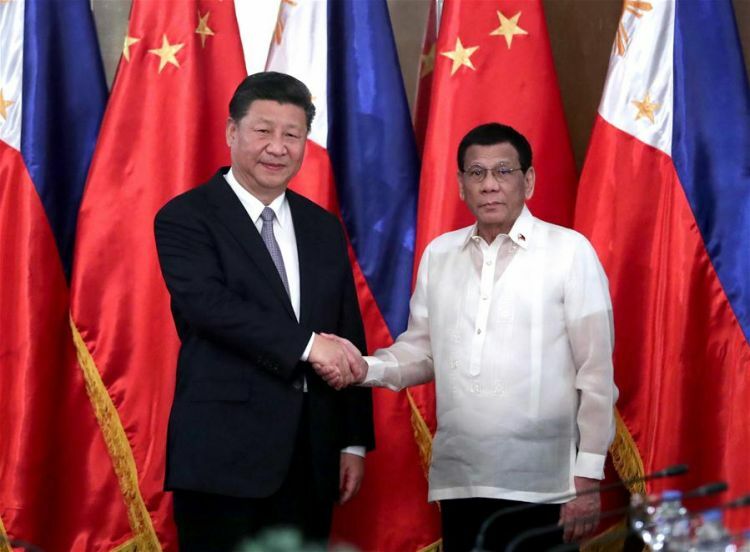 This is one of the more successful examples of regional partnership; largely out of resentment at perceived U.S. interference in his country's domestic affairs, Philippine President Rodrigo Duterte turned to China, as many countries had done previously, in search of economic cooperation unencumbered by political conditions. It was a popular move in the Philippines, as there had been some concern that the pugnacious Duterte might take a confrontational stance against China over a territorial dispute related to islands in the South China Sea. In particular, China has always hoped to persuade the Philippines, a long-term American ally, to turn away from supporting any attempts by the United States to block Chinese naval activities in the region. In this regard, the Philippines has acquiesced in the peaceful and long-standing Chinese policy of "pursuing cooperation while shelving disputes for the time being." Relations with the United States have been downgraded, though joint military exercises continue. The Philippines was also happy at the thought of being a beneficiary of the BRI, due to its great need for infrastructural improvements in a nation with no mainland and more than 7,000 islands that make land transport difficult. However, in 2018 the roll-out of BRI in East Asia has encountered some initial difficulties. Malaysia has shown that economic/political partnerships with China are vulnerable to governmental changes. The comfortable relationship China had established with the government of Prime Minister Najib Razak, became distinctly uncomfortable following his replacement with old war-horse Mahathir Mohammad, who began by questioning the arrangements made by his predecessor, and made it clear he would look very hard at the terms of accepting Chinese loans for BRI infrastructural projects. This was always going to happen at some point. Such a new policy as the BRI, after an initial welcome by regional partners, was bound to then face a certain backlash, or at least a re-examination of the terms of such assistance. Worries have emerged that nations receiving such large loans from the Asian Infrastructure Investment Bank (AIIB), the financial arm of the BRI, might find themselves caught in a debt trap. This does not mean China's regional strategy in any serious difficulties, as teething troubles tend to be inseparable from any new policy framework, and China will undoubtedly be able to make the necessary re-adjustments. Hence, the Philippines was a good place to start. There is much goodwill towards China, and President Duterte still enjoys huge popularity despite criticism both inside and outside the country. He and Xi Jinping took the opportunity to hail improved relations following years of tension over South China Sea issues, with the Chinese side proclaiming a "rainbow after the rain." However, there was a degree of backtracking on BRI-based joint projects. This is probably not so much a demonstration of faltering Chinese commitment to the relationship with the Philippines, but rather a desire to ensure any financial fall-out from BRI projects does not damage the future relationship in what has become an unlikely king-pin of Chinese regional diplomacy. Duterte is a populist president who has retained a remarkable degree of domestic support after two and a half years in power. He is still much admired by the poorest elements of the country left behind by previous administrations, particularly in his native power-base on the southernmost island of Mindanao.